Because the authorization for sending messenger to subscribers will change from the App level (Bots) to a Site level. 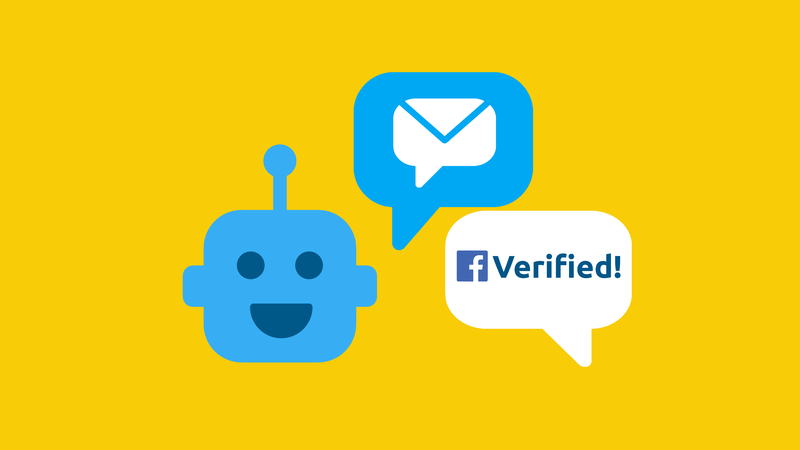 In this article, we’ll explain exactly how you can verify your Facebook Messenger Newsletter. However, Facebook has recently removed the deadline – so you don’t have to get it done before 2019, but it’s still important to complete this step! Subscriber messaging allows companies to use Facebook Messenger to consistently send content to their users. However, it’s important to note that only non-promotional content can be distributed. 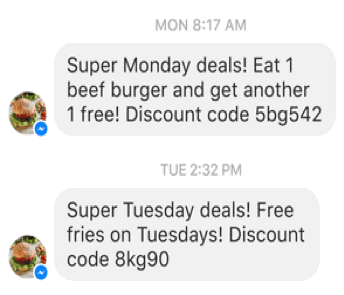 Messages with promotional or advertising content have to be sent over the fee-based Facebook ad format “Sponsored Messages.” A user can unsubscribe to subscribed messages at any time. Test the MessengerPeople Solution for B2B/B2C Marketing. 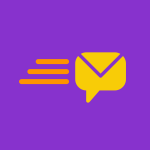 Messages: Integrations with the primary purpose of informing subscribers about new or important events, or information about sports, finance, business, real estate, weather, traffic, politics, government, non-profits, religion, celebrities, and entertainment. Productivity: Integrations with the primary purpose of helping users manage their productivity by assigning and administrating tasks. Examples here include managing calendar events, receiving reminders, and paying bills. Personal Tracking:Integrations that allow people to gather and track personal information about their fitness, health, wellness, finances, etc. Essentially, this simply means that subscription messages can not include advertising content. Since Facebook, as opposed to WhatsApp, scans all sent messages by default, site aministrators should absolutely follow the set regulations. Since there are other, pre-existing conditions for this type of message, Facebook’s motivations are fully reasonable. Subscription content can be sent outside of the 24-hour time window that restricts standard messaging. The recipient must have actively chosen to activate subscription messaging. When a user answers a subscription message, then the following conversation will be counted as standard messaging. 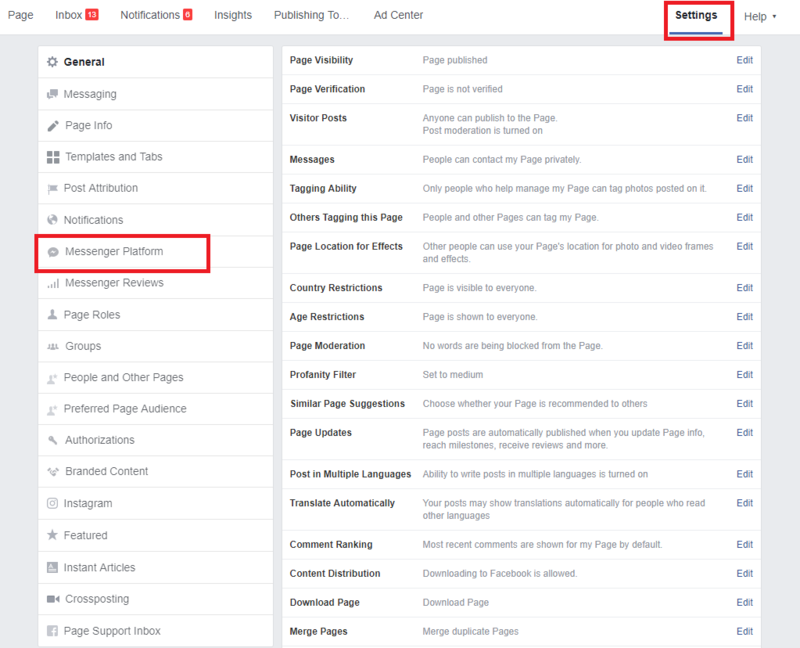 As a site administrator, you will find the application form in your site settings under messenger platform. Towards the middle, you will see the area „Advanced Messaging Settings“. By clicking on „request,“ a form will open, with questions about the type of subscription, the distribution frequency, and example content. We recommend offering 3-4 different examples of potential content, in order to clearly show that your newsletter is focused on news, etc. 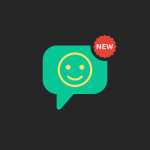 UPDATE 29th of November 2018: Uploading a Screencast that shows how users can begin a conversation with your Chatbot is not required any longer. Important: For MessengerPeople customers, it’s suggested to use the Facebook standard dialogue „Get started“ and to send a welcome message after this activation code. The Facebook review process can take a few days. If your newsletter is approved, you‘ll see a green check mark in the subscription messaging area. 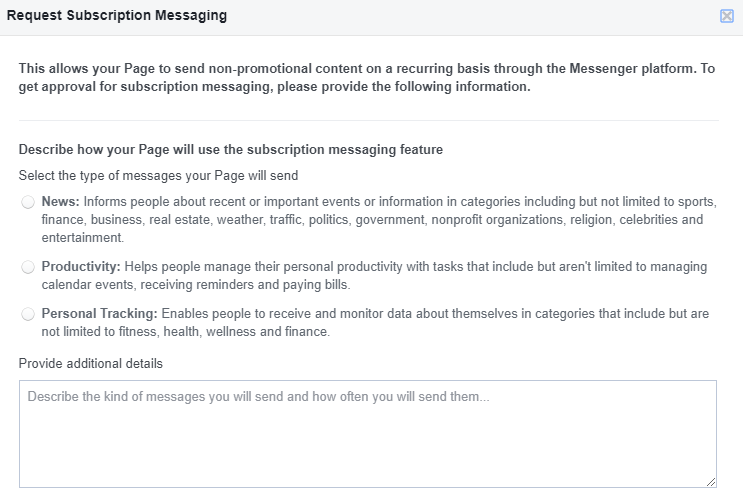 Subscription messaging via Facebook is only available for non-promotional content! The Bot verification process can take a few days, because the Chatbot is manually checked by Facebook employees. 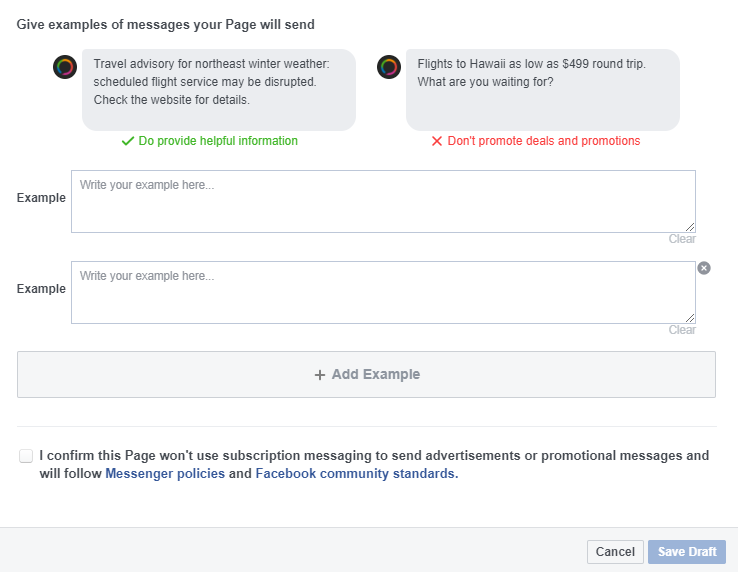 MessengerPeople customers are recommended to turn off their subscription confirmation dialogue (if it’s not in English, which is the Facebook review team’s main language) and to use the standard dialogue from Facebook.